Drowning is one of the major causes of death among children in both HIC and LMIC’s. According to WHO over 370,000 people die each year due to drowning worldwide. Drowning is counted the largest single killer of children in Bangladesh and East Asian countries. The Bangladesh Health and Injury Survey (BHIS-2005) revealed that drowning is the leading cause of death for children aged 1-17 year in Bangladesh, with approximately 17,000 children dying each year. Among them, 12,000 are children aged 1-4 years and the rest, 5,000 occur in the older age group 5 – 17 years. Considering the age group CIPRB developed strategy for child drowning prevention, children who are 4 years and below increase institutional supervision by keeping them in an crèche (Integrated Child Survival and Development Centre) for a certain time and children aged 4 years and above to train them for survival swimming lessons. In Bangladesh children learn swimming in an unsafe open water sources without supervision of adults or any qualified swimming instructor. Many of the children learn swimming in the ponds with help of their peers or relatives or often they learn by themselves. Learning swimming through this process, children often exposes themselves in danger. 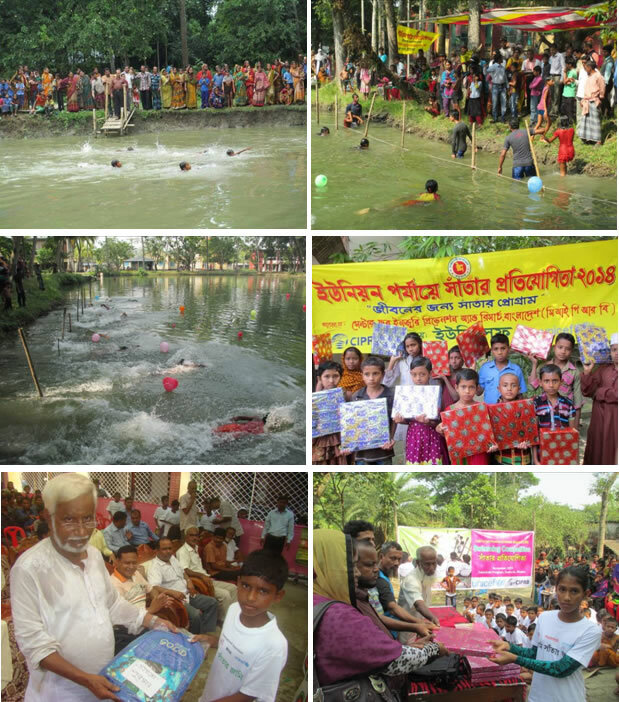 To protect children from drowning, CIPRB in collaboration with Royal Life Saving Society Australia (RLSSA), The Alliance for Safe Children (TASC) and Bangladesh Swimming Federation developed the survival swimming teaching program “SwimSafe” programme in 2005. Since 2006 the SwimSafe has been funded by UNICEF Bangladesh, Plan International and Save the Children. Till date a total of 477,937 children (boys- 265,804 and girls-212,133) aged 4 to 10 years trained for survival swimming lessons in 22 districts of Bangladesh. An evaluation conducted in 2010 among 84,000 SwimSafe trained children, it was found that that none of the swim graduates drowned. Another cohort study conducted among 109,668 children shows that that SwimSafe is a protective measure to prevent drowning. It was revealed that SwimSafe graduates had 96% less chance of drowning than the non-SwimSafe participants (RR 0.46; 95% CI 0.037 -0.071). The SwimSafe program a survival swimming teaching program, under this program a child must swim at least 25 meters, tread in the water at least for 30 seconds and be able to perform the rescue techniques. After successfully SwimSafe graduates must perform all 3 elements of the criteria. Children both boys and girls aged 4 – 10 years, who cannot swim or do not meet the survival swimming passing criteria of 25 meters swimming, 30 seconds treading and rescue skills considered as the potential candidates for “SwimSafe”. To identify eligible children in the community a survey CSIs conducts a survey in the community. CSIs are community youths both males and females who are good swimmers, accepted by the community, willing to volunteer as an instructor and have at least a secondary level education. Community leaders supports for the selection of the CSIs. In a modified pond both male and female instructor work together to train children for swimming lessons. This project has also been able to contribute towards breaking down gender barriers through female CSIs as their contribution is recognized as supporting a community needs. This has led to recognition of female adolescents in sports and freedom of movement. A manual was developed with the support of Bangladesh Swimming Federation (BSF), Royal Life Saving Society Australia (RLSSA), The Alliance for Safe Children (TASC), UNICEF-Bangladesh and the Ministry of Women and Children Affairs (MOWCA). A total of 21 steps were identified to learn survival swimming skills. Under the SwimSafe program, a child is declared a graduate when he or she can swim 25 meters, treading for 30 seconds and perform rescue techniques. In rural areas children learn swimming lessons in a modified pond. Community leaders provided support for the selection of the pond and community people provided pond as part of community contribution without any charge. The SwimSafe programme was designed to utilize low-cost locally available resources. Ponds usually modified by installing a bamboo structure as a safe venue for teaching children swimming. Locally available materials like pieces of bamboo and ropes are used to modify the pond. The following diagram and the photograph show the model of a rural swim teaching venue with a bamboo structure in place. In urban areas, due to a shortage of pond and natural water resources, children learn swimming in portable pools or swimming pools. Under SwimSafe program there were several portable pools installed in Dhaka city Portable pool can be installed in a school premises for a certain time and can be moved other places when the program is finished. CIPRB in collaboration with Bangladesh Swimming Federation (BSF), Royal Life Saving Society Australia (RLSSA) develop a group of Master trainers. All trainers receive a five days training under an expert supervision of the Master Trainers. After successfully receiving training trainers move to different districts and train CSIs in the district level. Since 2006 over 400 trainings were conducted and 4,329 CSIs were trained. Currently CIPRB has a panel of 50 trainers. To provide first responder services during swimming teaching and in any emergency situation all CSIs receive 2 days first responder training. A CSI can provide first responder services among the people living in the community. Till date under SwimSafe program around 3000 community volunteers were trained as first responder. A Community Swimming Instructor selects 15 children from the baseline and takes consent from their parents. At the same time CSI also inform children a date for swimming lessons. In the first day CSI inform all children about the SwimSafe program and water safety issues. Before entering the water CSI conduct a 15 minutes of warm up session with the children. To provide maximum concentration to the children CSI do not allow more than 5 children at the venue at a time. CSI follows all 21 steps to teach children swimming. To complete all sessions CSIs provides 12 days session for the children. As two CSIs work in a same venue so children can choose their time for swimming teaching. Children usually practice swimming under the supervision of CSI about 40 minutes. Through the SwimSafe program a child must swim at least 25 meters, tread in the water at least 30 seconds and be able to perform the rescue techniques. A SwimSafe graduate must perform all 3 elements of the set criteria. After successfully graduation a children receive T-shirts recognition of swimming learning. Involvement of the community people is important for the successful implementation of the program. A Community Based Child Protection Committee (CBCPC) usually forms with the support of community leaders in the pond area. The committee provides support during selecting of CSIs, children, ponds and other activities. Community people provide ponds without any charge and help during the pond modification. To raise awareness about the importance of swimming learning among the community people a SwimSafe program staff conducts a community meeting. All parents of participating children, community people living around the pond, community leaders and CBCPC members and teachers participate in this meeting. To raise awareness among the children at the end of the swimming learning program, all trained children participate in a swimming competition. All community leaders, Government Stakeholders, parents participate in the competition to encourage the children. The competition is organized separately for boys and girls. Champions from the village level compete at the union level accordingly upazila, district and national level. From each group, the champion, first and second runner ups are presented with awards and crests. This swimming competition encourages graduates of the SwimSafe programme to continue practicing their swimming skills and encourages other children to join the SwimSafe programme. To maintain quality of the SwimSafe program CIPRB developed different tools. All employees use the tools during supervision the SwimSafe activity in the field level. Beside that as the program is community bases so community leaders also provided their efforts for maintaining the quality of the program. The project staff follows all developed checklist for maintaining the quality of the program. There are clear criteria for selection of CSIs, children and modification of the venues. Coordinators and Managers provide necessary support during the training sessions. Project supervisor must present during the beginning of the swimming sessions and day of graduation. At the end supervisor develop a data base of the all trained children. Since 2006 total 4,329 CSIs were trained in rural areas under SwimSafe program, with the support of these CSIs a total of 477937 children were trained for swimming lessons. The cost of the program depends on the number of children receives training. The cost for each child training is US $ 6 to $ 10. If the number of children is 100,000 then the cost will for each child training around US $ 6. Since 2010 each year under SwimSafe program 70,000 to 80,000 children have been trained for swimming lessons with the financial support of UNICEF Bangladesh. CIPRB has the capacity to train 100,000 children each year using the current staff and infrastructure. Centre for Injury Prevention and Research, Bangladesh (CIPRB) has been working with children safety since 2005 in different districts across Bangladesh. Since its inception, CIPRB has developed and implemented child protection policies as a standard procedure and continues to expand its capacity in this area. In 2011 CIPRB developed a child protection policy manual with the financial and technical support of UNICEF Bangladesh.